A soldier stands between demonstrators and riot police facing off in the Musaga district of Bujumbura, Burundi, May 4, 2015 (AP photo by Jerome Delay). When Burundi’s ruling party, known the CNDD-FDD, chose President Pierre Nkurunziza on April 25 to run for a third five-year term in a presidential election scheduled for June, his supporters did their best to mark the occasion with festivity. In the capital, Bujumbura, hundreds of youths in the party’s red, white and green t-shirts jogged alongside the presidential motorcade, chanting the party’s theme song. Many had legitimate cause to celebrate. 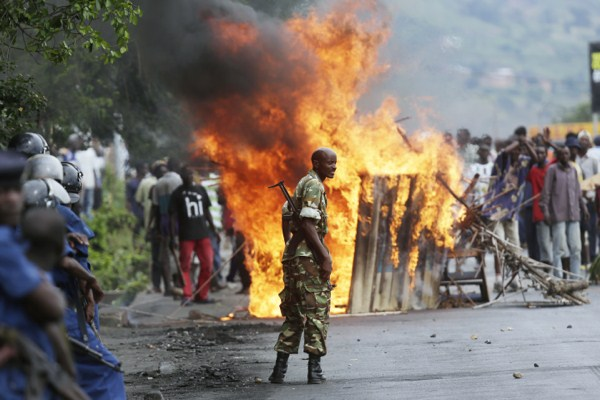 Under Nkurunziza, a former rebel leader elected president in 2005, Burundi had emerged from a 10-year civil war to become what many hailed as an international model of peace-building. Despite the regime’s continued use of targeted killings, the country had enjoyed a decade of hard-earned stability. Tensions between Hutus and Tutsis, a critical driver of past conflict, had significantly subsided.